FOX has issued the press release for the May 9 double bill of Brooklyn Nine-Nine, "Cop Con" / "Chasing Amy". The precinct packs up and heads to the Tri-State Police Officers' annual Cop-Con, which is usually the Nine-Nine's excuse for a big annual party. But the squad's fun is threatened this year when Holt asks them to be on their best behavior. 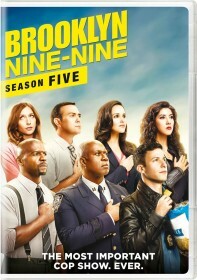 Then, Amy suddenly vanishes hours before taking the Sergeant Exam, and it's up to Jake and Rosa to find her before it's too late in the all-new, special one-hour "Cop-Con/Chasing Amy" episode of BROOKLYN NINE-NINE airing Tuesday, May 9 (8:00-9:00 PM ET/PT) on FOX.